Should you write for free? 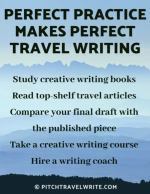 All travel writers, at some time during their writing career, struggle with the contentious issue of whether they should write articles for free. What? Do you mean that some magazines don’t pay their writers for their work? Sadly, this practice is far more widespread than you can imagine. You’ll be amazed at how many magazines don’t pay their contributors. Some magazine editors rely on our naivety, vanity, goodwill, and perhaps stupidity to write for them. Professional writers regard magazines that do not pay for their articles with absolute disdain. They think magazine editors who don’t pay writers clearly do not value them as professionals. In absolute terms, most freelance professionals would agree with these thoughts without hesitation. After all, have you ever called a plumber or an electrician and asked him to work for free? Of course not. Whatever our philosophical and personal views of this practice, it remains a fact of freelancing life. Sooner or later you’re going to have to establish your own policy to deal with it. But this cloud has a silver lining. In my experience over a number of years, I have received some benefits from writing articles for free. Some of these benefits are direct, others indirect. To help you decide on your own policy, here’s my take on when you might want to consider writing for free. In your first year or two of freelance writing, it can definitely be to your advantage to write some articles for free. Of my first 100 published articles, 29 were freebies. I wanted bylines and I wanted them fast. So that was my purpose. 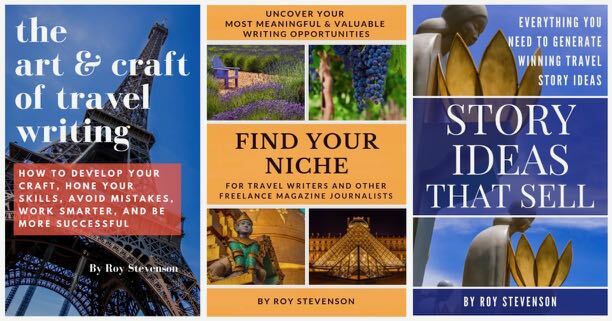 My mission was simply to get my name out there and be published as much as possible, and writing some freebies boosted my byline count. So, writing articles gratis is a great way to rapidly build your bylines. For beginning freelance writers, the value of extra writing practice from writing free articles also should not be underestimated. This extra writing helps you hone your writing skills and query letters to editors. And also for novice freelancers, you’ll find your confidence grows with every piece that is accepted for publication, regardless of whether it was written for free or for payment. After you’ve collected some bylines and gained some confidence, you’ll decide you’ll no longer need to write for free. In my early years I snagged a column in a magazine by writing a free series of articles about military museums around the world. These articles were from a Guide Book I had previously written on this subject, so at least I didn’t have to write the reviews from scratch. And so, besides magazine bylines, I can say I have a magazine column to my credit. This is something that I wanted. Once again, it suited my purpose. It was part of my strategy. 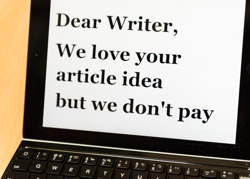 Don’t forget – just because you write an article for free, it doesn’t mean you can’t sell it for money later. 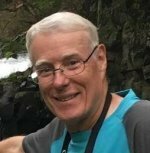 As I have expanded my magazine/editor base over time, I have subsequently sold almost all of my free articles for compensation – so the time I spent writing those freebies has not been lost. It was just delayed. How have I done this? I keep a file of my unsold articles, review it periodically, and try to resell the stories to editors of new magazines I’ve discovered. Only a handful of the stories that I originally wrote for free remain unsold. What about the first publication’s rights to your article? So far, every magazine that has taken my work for free has at least had the decency to relinquish all rights back to the writer after publication. Writing articles for free generally means you are free to sell them elsewhere. Before you give away an article, be sure that you do not away your rights to do this. Finally, be sure to pitch your articles to reputable magazines first. Try and get paid for your writing before agreeing to do it for free. Is there something better than money? For travel writers, sometimes travel is better. Travel writers get paid in different ways. You can get paid for your words when you write the article and it gets published. Another way travel writers are paid is through comped travel. And, you can do both. 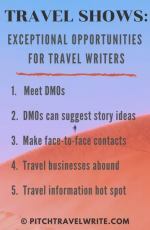 Experienced travel writers know how to parlay their print and online travel assignments to cover their hotel, meals, entry to tourist attractions, and sometimes their airfare. Imagine that you were invited on a press trip to a wine region in France. All expenses paid for a week long cruise. Your assignment is to report on the experience, cruising along in on a luxury barge, eating gourmet meals, visiting villages, wineries, castles and abbeys, and tasting new wines throughout each day. Would you consider writing an article for free in this case? Most of the time, the cost of travel far outweighs what you will be paid for an article. So it’s sometimes worthwhile to accept an unpaid assignment when your travel is comped to a place that appeals to you. Every situation is different, so consider the situation, do the math and then decide if it’s worth it. Another reason established writers do the occasional story for free is when you want to get the attention of an audience and lead them to something that pays better in the long run. For example, drawing people to your e-commerce site may have the potential to be much more profitable than what an editor might be willing to pay you. If you sell products or services, writing an article for free may be a good way to find or expand your audience, give them some valuable information, and lead them to your website or even your bricks and mortar store. Sometimes it’s worth it to write for free for an organization or a cause that you believe in. In this case, you make a conscious decision to work for free to help get a message out that is important to you. Never tell an editor up front that you will write for free. Wait until the editor tells you “we don’t have a budget to pay freelancers”. Then you can make a choice about whether or not it fits with your strategy. Always write your best article, even when it’s gratis. It doesn’t matter that you’re not getting paid. As a professional writer your work should always reflect the best you can do. Especially on the internet, poorly written articles displayed to the world indefinitely could kill your chances of ever getting published in paying publications. 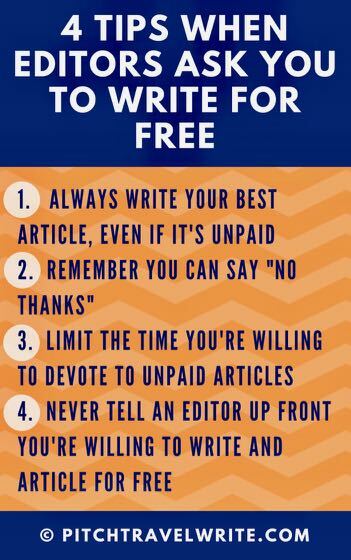 Remember, there is no obligation to write for free. Just because an editor likes what you wrote, you can still tell the editor “no thanks”. Flattery doesn't pay the rent. Only write for free when it serves another purpose that you are trying to achieve. Finally, limit the amount of time you’re willing to spend on writing for free. Professional writers deserve to be paid for their work the same as any professional. Working for free should never be a big part of what you do.